Water bottles can be purchased from our boutique or brought from home. We provide all the equipment you need for your session. 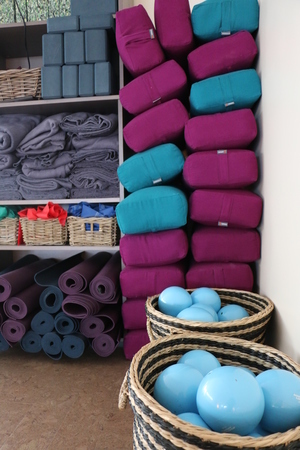 Mats, Bolsters, straps, blocks, blankets and bands, they are all included in your membership. You are welcomed to bring your own mat if you prefer. Dress in comfortable clothes that you can easily stretch and move in. Bring a water bottle. For Dance classes that require shoes it is preferred if you bring indoor shoes. On your first visit it is best to arrive 15 minutes early so you can complete the waiver, sign in, and pay for class. You can speed this up by completing the registration online ahead of time. Be sure to tell us if it is your first time doing a Yoga or Pilates class. MOVE Studio welcomes people of all ages to take part in our classes. Minors must have a parent or guardian complete their waiver before they can participate. Children under 13 are required to attend with a parent or guardian. Drink lots of water before class, Stay hydrated! Avoid eating before class, a full stomach can make practice difficult and some poses uncomfortable. If you are having difficulty with a pose, just relax and lay on your back. Don't push yourself too hard. Tell your instructor if it isn't working for you. The studio is locked during class and open in between classes. Check our schedule for the best time to visit or give us a call! Please do not knock on the door when class is in session. Thanks! That's less than the cost of two drop-ins! Please be on time. Arrive 10 minutes before class begins. If you reserved a spot, it will be given away 5 minutes before the class starts to someone waiting if you are absent. MOVE Studio is a perfume free environment. Refrain from using cell phones in the studio and kindly turn your ringer off when you are in class. Don't be a floor hog. Some classes get full attendance, leave space for your neighbors. If you must leave class early, advise the instructor and setup your mat near door so you can exit without disrupting others. At the end of class please clean your mat with the supplied spray and rags, and put equipment back in its place. Our cozy studio has a relaxed and inspiring atmosphere and a state of the art Dolby Atmos 3D sound system. Everything you need is included... we provide mats, bolsters, blocks, blankets, straps, weights, and bands at no charge for your convenience. 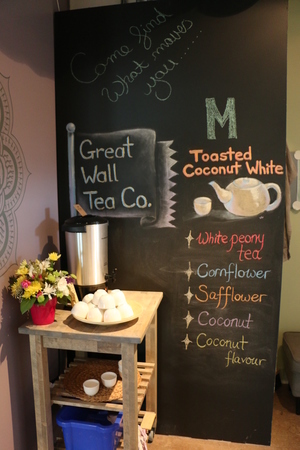 We also have complimentary hot tea from Great Wall Tea Company and cold filtered water on tap.